There was one rather thick piece of walnut, about 18 inches long that was a bit of an odd trapezoidal shape. It just struck me, like a lightning bolt, that would make an awesome display and serving tray! I knew the thickness of the piece, roughly 2.5 inches, would allow me to experiment with carving some feet for the bottom of the tray. After studying the walnut slab for a bit, I thought 4 feet would be perfect, so I needed to lay them out with a permanent marker to give me guiding lines while carving. Now carving is messy business. Even with using two shop vacuums hooked up to my work table and an air filtration system on full blast, I have ended up with mountains of sawdust on the floor and thick layers of it covering every surface of the shop. Not only is this massive amount of sawdust an annoyance after carving is completed, but it’s also a health risk. No one enjoys being able to blow miniature pieces of furniture out of their nose at the end of the day, especially not me! Luckily, I have found a solution that helps my lungs, nostrils, and shop cleanliness! HomeRight, a company out of Minnesota makes a portable spray shelter with straps that allows you to attach a filter and fan to it. Now the original intent of the spray shelter is place table top type of products in it to be sprayed with paint or other finishes. In this instance the fan and filter help pull the overspray away from the work piece and onto the filter. This is also something super useful! However, when I saw this shelter with the fan and filter, a lightbulb went off and I thought it would be the absolute perfect solution for my sawdust control issue. So, I set the shelter up on one of my portable workbenches and pimped it out with the filter and fan. I also used a piece of scrap plywood to serve as a solid surface inside of the shelter to place my work piece on without worrying about the fabric of the shelter bunching up while moving the piece around. I put the Lancelot attachment from King Arthur’s tools on my angle grinder, clamped down the walnut slab to the table top and I was ready to get started! I used the Lancelot attachment to do most of the rough shaping of the legs on the bottom of the tray. During this time, I had the fan set on high, to allow for maximum dust removal while I worked. It did a fantastic job! It pulled away all of the fine dust particles without any problems. The larger shavings kicked off from the tool were also contained within the shelter which made cleanup a cinch! Probably the best thing for me was when I was done using the tool I could immediately take off my dust mask because the air was not full of sawdust. All the sawdust was either in the filter or in a nice pile along the sides and back of the shelter. Once the feet on the bottom were roughed out, I switched the Lancelot attachment out for a course holey Galahad attachment that is also from King Arthur’s tools. I used this attachment to dish out the top of the tray, to shape the sides, and to refine the feet on the bottom. I really enjoy using the holey Galahad attachment. It allows you to have great control while carving and the holes in the attachment allow you to look right through it while in use to see the contours you are creating. The holey Galahad attachment creates a very fine dust. The fan and filter did an excellent job of capturing at least 85% of this fine sawdust, leaving very little within the shelter to be vacuumed up. After using the Holey Galahad attachment on the angle grinder to refine the design it was time to sand. I used my orbital sander, starting with 60 grit sand paper and working all the way up to 180 grit sand paper. This left the surface smooth, all carving marks removed, and prepped and ready for finish. Oooo, pretty colors! Time to get bold! Since walnut is prone to have natural purple hues within it, I decided I wanted to celebrate that by dying the tray purple. I use a water-based fabric dye, FolkArt by Plaid Crafts. Because the dye is rather viscous and water based I thought it would be easiest applied by spraying it on. Before I got set up for dying the tray I vacuumed off the filter and the work surface so the dust would not interfere with the spraying of the dye. To spray the dye on I went ahead and used the Finish Max Super sprayer from HomeRight. Though the dye is pretty viscous, I went with using the green needle to make sure it would flow through the tip without any problems. I mixed two different hues of purple FolkArt dye to get the perfect shade of purple. I added a bit of water as well to thin it some, again to help with the flow from the sprayer to the piece. Then I went to town spraying. 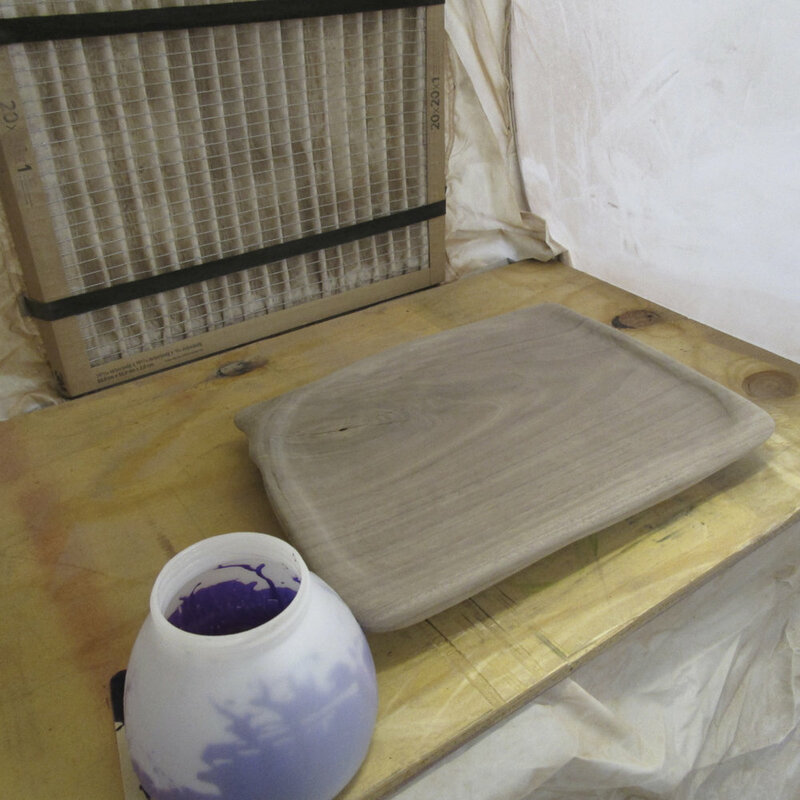 I could do both side of the tray at once, being water based and a dye, it soaked into the wood rather quickly. It took me 3 minutes or less to dye the tray. Normally I would just use a rag and wipe the dye on, which generally would take me at least 20 minutes to get the whole tray completed, so this was a much-appreciated time saver! And since the dye is water based, the clean up of the sprayer was also super quick and easy. Now all that is left is to apply a top coat. Since the intent of this tray is for serving and displaying, a lacquer finish would be a great finish. Lacquer will provide a nice gloss and a nice amount of protection in case anything was to get spilled on it. And once it is fully cured it will be 100% food safe as long as food is not cut on the surface.